The Joker Desk is captivating with its focus on classic Moll details while not compromising in design, quality and function. Desk comes in White. For Oak or Maple styles, please see the Clearance page. 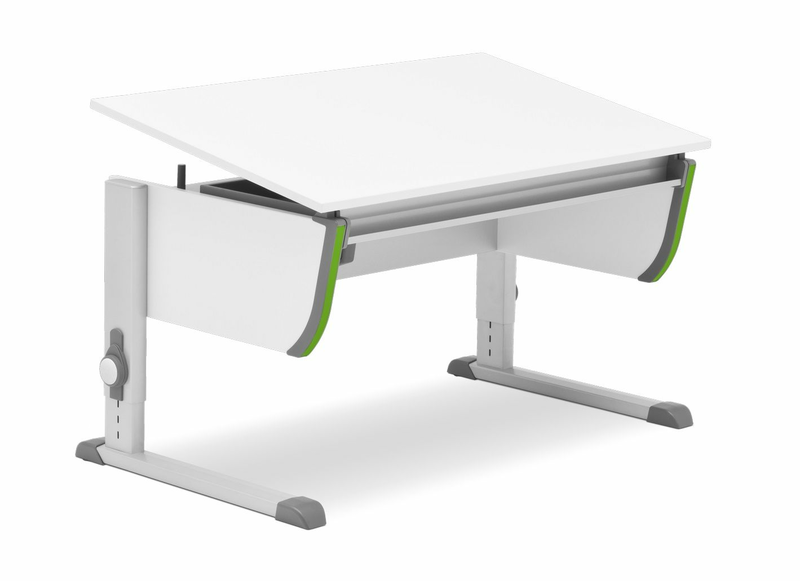 Moll Desks are uniquely designed with Moll brand German engineering, and meant to adjust to fit your child at every height. 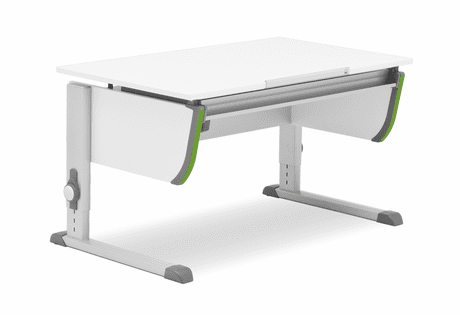 The desk height and desk surface adjust fully to ensure healthy posture and encourage good study habits. 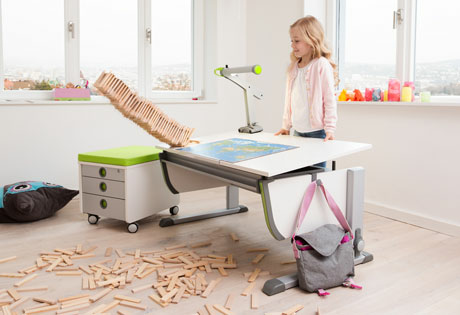 Moll Desks allow a child to customize their workspace for the entirety of their schooling career. Children need desks and chairs that can be customized to the ergonomics of the body in every phase of development. Highly functional and cleanly designed, the Joker Desk from Moll is built to grow with your child from the moment they begin their schooling. 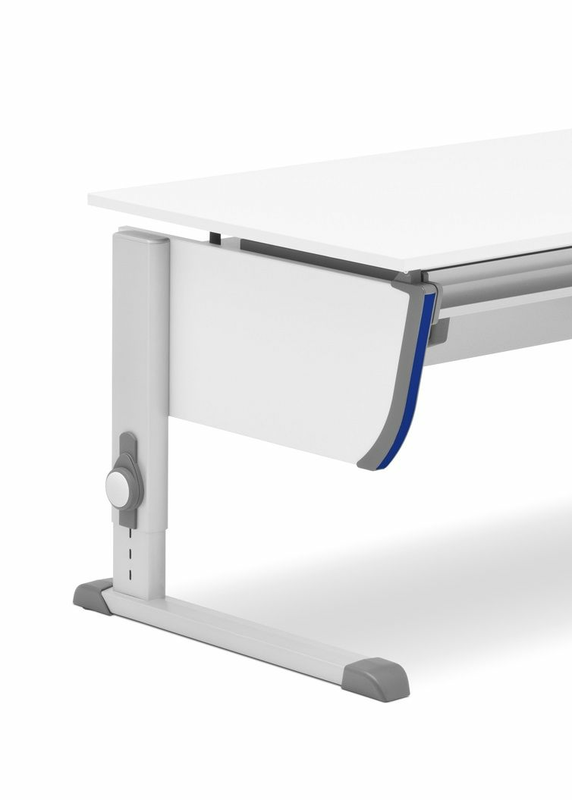 The desk can be manually raised and lowered to 10 different heights, with proven hook fitting. 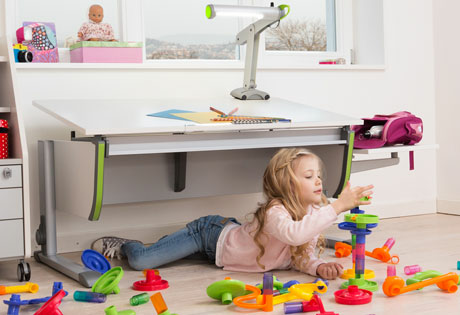 Adjusting the desk is simple and allows you to get the right height for your child�s posture! The Joker Desk is captivating with its focus on classic Moll details while not compromising in design, quality and function. 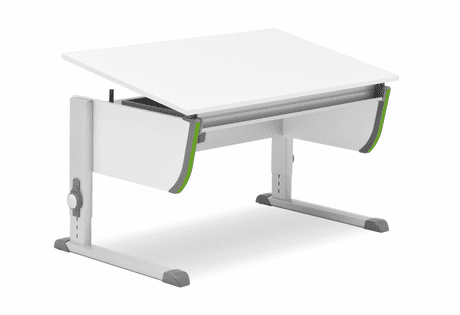 The Joker desktop adjusts with a basic spring-supported tilting mechanism, which allows for ergonomically healthy posture when drawing, writing, reading or doing projects. 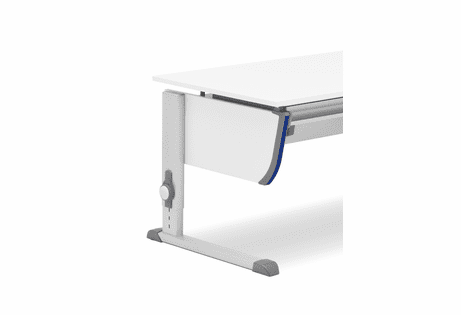 The desktop tilt can be continuously adjusted to an angle of 18�. Desk height ranges from 20.87" to 32.29"
Dimensions (in inches): 46.06" x 26.77"
We love our white joker desk. It has all the basic elements for being a great table. Easy set up, and very good for my 6 year old. It instantly becomes his favorite table, and he has spent many hours working on this table. very cool design. We love our white joker desk! Purchased for my 6 year old. Came packaged perfectly which is a nice change from the usual products purchased from China. Most things come with scratches and dents no matter how much you pay. Extremely satisfied and looking forward to many years of use. We had purchase Moll adjustable desks and Scooter chairs for our 2 daughters 5 yrs ago. They were 4 and 5 yrs old at that time and they will be using it for another 5 yrs without any problems thanks to perfect and engonomic design of the Moll furniture. Moll furniture has an excellent quality and we are considering it top of the line. We have not had any problems with desks or chairs in the last 5 yrs. Customer Service is excellent. Perfect size table for my son and the adjustable table height I believe will supports his need until college age. uses the desk all the time, reads or sets up the computer and does Scratch or draws with his little sister (he has made full use of the pencil drawer). It's easy to overspend on gear for kids, that's for sure. This desk &amp; chair though have proven to be constructed of top-quality materials, it's smart, it works and my son loves it. The style also makes being at a desk seem less like drudgery. In the price/value ratio - we feel like the value has FAR exceeded the price. Hard to find any faults with the purchase experience, the product and the results. We bought a joker desk and paired it with a scooter chair for our 7-year-old. The quality is amazing and the design is very stylish. My son enjoys using his desk to do homework, read and work on his projects. Will come back for another desk-chair set for our daughter soon. It\'s perfect and works better than my expectations.My daughter feels comfortable and her work gets more attention on it. We purchased the desk for our 8 years old son and it has been a hit at home since day one. Along with Maximo Adjustable Chair we noticed our son was feeling more comfortable while doing homework and with a better posture - not to mention the excitement to have his own space. Furthermore, we love the fact that the desk can grow with our son and we are really satisfied with the high quality product, clean design and variety of accessories. The ordering process was really smooth, and the desk, chair and accessories arrived in perfect condition, exactly what we expected and in a timely manner. We are definitely replicating the experience for our daughter in the near future. The desk works great for my 8 year-old daughter who loves to read, draw and write. It's easy for her to adjust by herself. The desk is very well constructed and best of all &quot;Made in Germany&quot;. I only had one problem during assembly. For some reason, two of the pegs were too big and wouldn't fit correctly. I contacted Moll Desks and they promptly offered to resolve the problem. Overall I give 4/5 stars for the product (because of the odd pegs) + 1 extra star for the customer service. THIS IS THE BEST DESK FOR MY KID. HE LOVES IT SINCE DAY 1. BEST CUSTOMER SERVICE. I GOT MY DESK WITH A LIL CHIP AND THE VERY NEXT DAY, THEY SEND ME THE REPLACEMENT!